【明報專訊】I was thrilled to watch Hebe Tien's (田馥甄) concert in Hong Kong Coliseum on June 17 (Friday). I was so lucky as to have a photo taken with her. I began to listen to her music and feel connected with the lyrics of her songs when her first solo album came out. I didn't attend any of her previous concerts. Her voice was totally amazing. 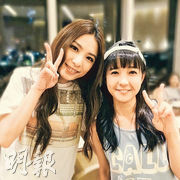 I also met Selina (任家萱) of S.H.E in the audience area! Two lucky things happened in one evening! She was so cute! All her fans, including us, turned on their mobile phone flashlights and sang A Little Happiness (小幸運) together. I was so excited that I couldn't get to sleep that night.